Having regard to the tight 180 day time line set in the terms of reference of the SCC, it is prudent that the SCC report to you at regular intervals on progress made in its work and in the investigation of allegations of state capture referred to in its terms of reference. This report is the first such preliminary report. The Office of the Public Protector (OPP) requires that its “State of Capture” report be regarded as the starting point of the work of the SCC. In view of the fact that there have been numerous developments of relevance since the publication of that report in October 2016, it is appropriate to report to you on the impact of these developments, listed below, on the nature and scope of the work of the SCC. The so-called #GuptaLeaks have received wide press coverage and will be familiar to you. They comprise a litany of allegations of malfeasance and misfeasance in the business and other dealings of your friends the Gupta brothers and their corporations. Your son Duduzane features prominently in a manner that must involve the risk of a conflict of interests for you. A high powered and carefully researched academic report under the auspices of PARI highlighting the “silent coup” involved in state capture has been published in May 2017. The SACC’s panel of experts has, in the same month, produced its explosive “Unburdening Report” which identifies the “seven deadly sins” of state capture. Several books, notably “The Republic of Gupta”, “The President’s Keepers” and “Enemy of the People”, all serious works of non-fiction, are now available to the SCC. They have been written by investigative journalists to the highest professional standards and corroborate the observations made in the OPP’s report while also detailing fresh and previously unknown instances of malfeasance. Criminal investigations of the Gupta brothers, Minister Zwane, the current ANC Secretary General (regarding the Estina farm debacle first reported on in 2013), those involved in corruption at Eskom and with Eskom and others have commenced. Furthermore, complaints of criminality regarding the Nkandla debacle and your removal of NDPP Mxolisi Nxasana are pending as are the OUTA dossier against you and the O’Sullivan complaints set out on the “Forensics for Justice” website. The Helen Suzman Foundation has commenced review proceedings against Eskom and Corruption Watch has laid criminal complaints against the two top SARS leaders. A wealth of information, given on oath, is publicly available regarding all these matters. 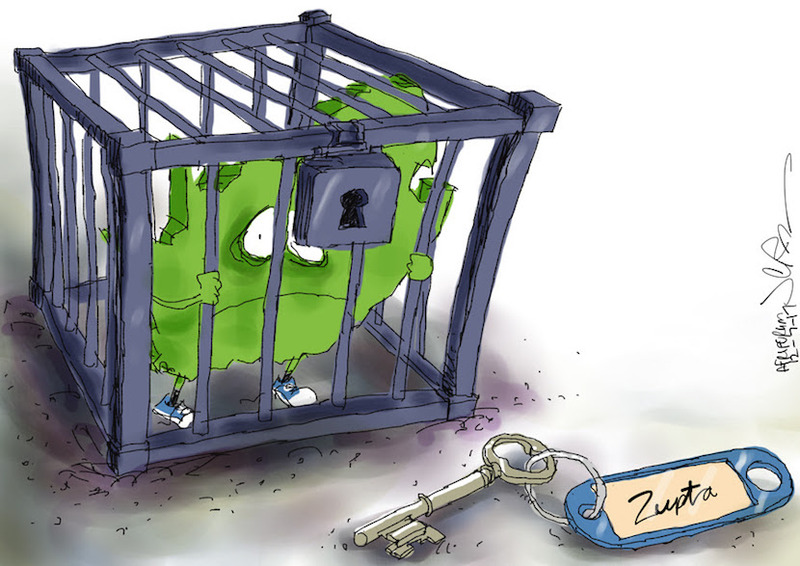 “South Africa is captured by the Zuptas.” More magic available at jerm.co.za. 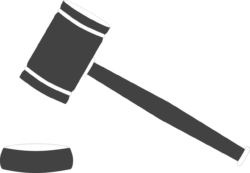 Having perused and/or considered all of the material listed above, it is plain to the SCC that there is at least a prima facie case of criminality to answer in respect of all of the matters covered by the OPP’s “starting point” and by the other developments described in the publications listed above. It would be an unnecessary, costly, lengthy and prejudicial exercise for the SCC to take oral evidence on these matters when criminal prosecutions are so clearly and obviously indicated. Authors have confirmed on oath that their writing and research supports the observations made by the OPP. These confirmations were filed of record in the Constitutional Court matter of the QPC and others v The President and others last June. A swiftly issued subpoena duces tecum on the Gupta’s empire has provided the SCC with confirmation that the email trove commonly called the #GuptaLeaks is not fake news but is actually a genuine reflection of the activities, communications and transactions it reveals. Of particular relevance, to the discharge of the mandate of the SCC, are the judgments in the recent Nxasana matter and in your review of the OPP report. These two High Court Full Bench judgments are mutually contradictory in their approach to the risk of conflict of interests. The potential exists that the Nxasana judgment will be used to assail the legitimacy, legality and constitutionality of the establishment of the SCC. Either any president who is unable to act must be replaced by his deputy in the appointment of a commission of inquiry in circumstances in which, like those at present in existence, there is a risk of conflict of interests, or, the strategy resorted to by the OPP is a legally adequate way of working around the problems posed without breaching the doctrine of the separation of powers. The first judgment posits your deputy as the appropriate person to act, while the second does not. 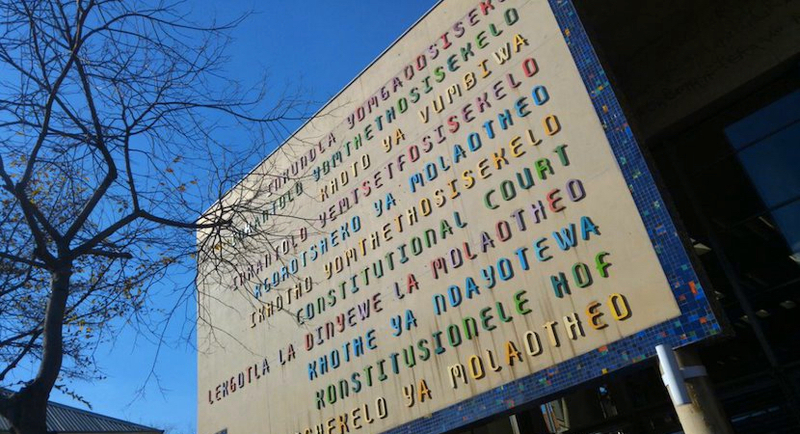 The final and definitive interpretation of the provisions of sections 90 and 96 of the Constitution is a matter for the urgent attention of the Constitutional Court. The SCC is accordingly applying urgently to that court for the necessary declaratory relief. Taking this precautionary step is not to say that the urgency of the overall task at hand is any less. The danger of the matters of state capture becoming “cold cases” must be diligently guarded against lest evidence is lost, funds misappropriated become irrecoverable and witnesses disappear or become unavailable. These tasks are the work of the criminal justice administration, not the SCC. Accordingly, the SCC recommends that steps be taken to strengthen and properly resource the criminal justice administration so that the Hawks and NPA (or a replacement specialist anti-corruption entity) are appropriately capacitated to investigate and prosecute all alleged instances of state capture revealed in the sources mentioned above. State capture is both enabled and emboldened by the prior capture of the criminal justice administration. In this sense its current dysfunction can be regarded as a cause of the spread of state capture with impunity due to the absence of proper protection of the state and the people. Your administration’s insistence on the disbandment of the Scorpions and many of the unhappy senior appointments you have made in the NPA and SAPS speak to the capture of the criminal justice administration from the beginning of your two terms as president of the ANC stretching from December 2007 (when the ANC resolved to disband the Scorpions) to last month (when Lucky Montana publicly accused Dr Zweli Mkhize of attempting to solicit a bribe for the ANC from PRASA). 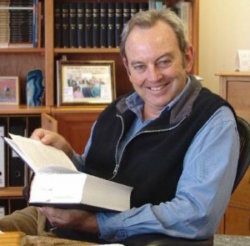 The practical difficulties which now present themselves are that the Nxasana judgment (among others in similar vein) strongly suggests that the NPA leadership itself has been captured, while the capture of the Hawks, long used as the “dirty tricks department” of a certain faction in the ANC, (as best illustrated by the persecution of former Minister of Finance, Pravin Gordhan, by the written response of General Anwa Dramat to his suspension as head of the Hawks and by the mistreatment of recently retired Hawks General Johan Booysen) render the criminal investigation of state capture problematic. Unless there are systematic and systemic reforms aimed at rendering both the NPA and the Hawks (or such other machinery of state as may be needed to replace them) sufficiently operationally and structurally independent to be constitutionally compliant, the whole purpose of the investigative work of the SCC will be defeated due to the absence of effective anti-corruption machinery of state to follow through by dealing appropriately with the prima facie indications of state capture. Both Archbishop Tutu and Adv Madonsela favour the establishment of a new Chapter Nine Institution long championed by Accountability Now. The creation of a new institution is certainly the best guarantee of a successful fresh start in the war on corruption and state capture. In this regard, the SCC refers you to the judgements of the Constitutional Court in the trilogy of Glenister cases. The judgments in the second and third of these cases have been honoured in the breach by your administration. The criteria they set for the structure and operations of the Hawks are not consistently applied in their operations, so much so that all five of the main criteria required by the court are, to a lesser or greater degree, absent. Until specialised, trained, independent, properly resourced personnel who enjoy security of tenure are in place the prevention, combating, and investigation of state capture will not be effectively and efficiently possible, as is required by Section 195 of the Constitution. Obviously, until the NPA leadership is repopulated by more independent personnel, the prosecution of the corrupt will remain problematic. 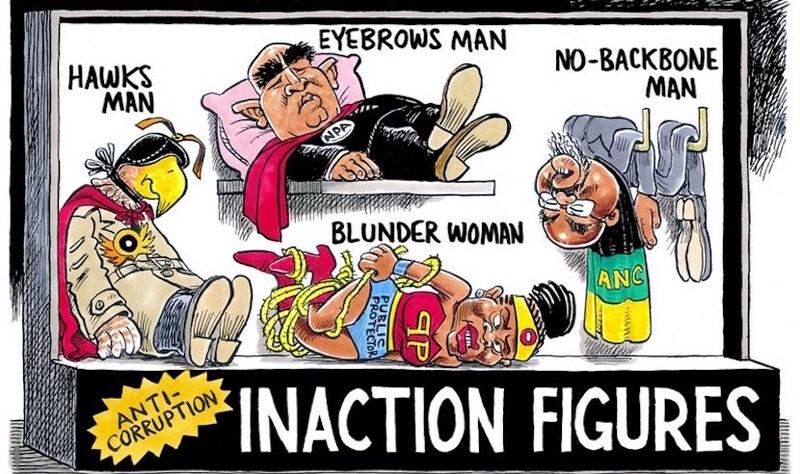 Instead of implementing these “STIRS” criteria for the Hawks, set in binding fashion by the highest court, your administration has established an Anti-Corruption Task Team (ACTT) drawn from a plethora of institutions to deal with corrupt activities involving more than R 500 million. This figure certainly includes the allegations of state capture. The ACTT is both ineffectual – it has, since its formation in 2010, never run a criminal prosecution for corruption that was not settled by a plea bargain, and unconstitutional – because the court requires a single entity to deal with the corrupt among us. It is urgent that remedial steps be taken to clear the NPA of all captured personnel and to reconstitute the Hawks in a manner that achieves compliance with the Constitution. If this is not done, the capture of the state will proceed apace and the work of the SCC will be in vain or will be frustrated by the capture of these two state institutions. The SCC has noted that there are signs that the Hawks and NPA are, after a long period of passivity, acting, sometimes ham-handedly, but nevertheless in a pro-active way to deal with some of the allegations of state capture encapsulated in the OPP’s report. Whether this sudden activity is a feint and why it has taken so long is a matter of conjecture that should be looked into with a view to ensuring that the proper administration of the criminal justice system never again takes so long. Justice delayed is justice denied. 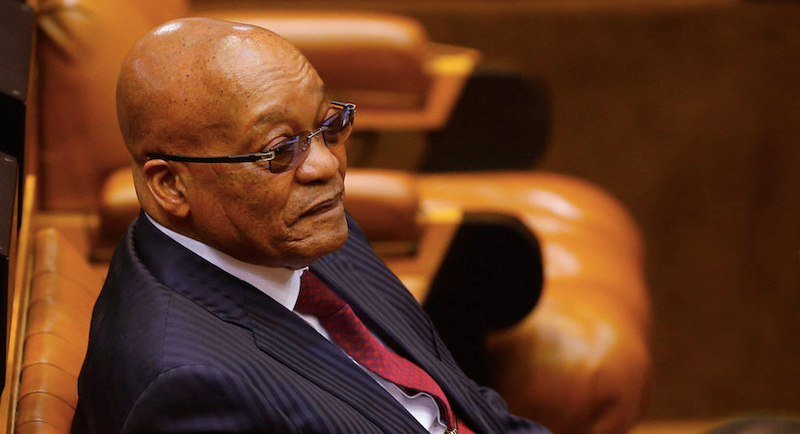 As regards your own position, Mr President, the SCC notes that the 783 counts of corruption, fraud, racketeering and money laundering, arising from your relationship with convicted criminal Schabir Shaik, have been reinstated by the SCA. The complaint by Accountability Now that the removal from office of Nxasana was effected by you in a corrupt manner has been vindicated by the civil judgment in the Gauteng North High Court in the Nxasana review case. In the long un-investigated criminal complaints around the Nkandla saga, where of the R246 million spent, only a small fraction has been recovered from you, there is also a great deal of prima facie evidence of malfeasance in which you are prima facie involved. You have already apologised to the nation for this shocking state of affairs. The cumulative effects of all of these instances of alleged malfeasance make it imperative that you show more tangible contrition now. In these circumstances, your position as head of state and head of the national executive is constitutionally and ethically untenable. You, in effect, have a full time job dealing with the allegations of criminality against you. Your representations to the NPA on the Shaik related charges are unlikely to succeed. The NPA has confirmed that all 218 witnesses are available to testify against you in that matter. The winds of change blowing through the body politic are likely to render your representations futile, both immediately and on review. The representations do not detract from the fact that you are a suspect in multiple criminal matters, not all related to state capture or to your relationship with Shaik. The SCC recommends that you resign without delay. Should you fail or refuse to do so, the SCC recommends that parliament take such steps as it deems fit to remove you from office as soon as possible whether by a vote of no confidence or by impeachment. You are simply too conflicted to continue in office. A further preliminary report will follow as soon as the progress of the work of the SCC allows.